As we peer back further in time, the variations that occurred in the Earth's climate become more profound. The Earth has gone through alternating periods of glaciation when huge ice sheets covered the higher latitudes, and warm periods, some of which extensively melted polar ice. The oceans have risen and fallen as much as a hundred meters through these changes. No sensible study of global climate change can completely ignore this history, even though we are presently in an interglacial period, because the forces that produced these oscillations are still there, however tentatively balanced or dormant they may be for the moment. Climatic variability on the timescale of tens of thousands of years has turned out to be a predominant pattern in Earth history. The last two and a half million years have been marked by many global climate oscillations between warmer and cooler conditions. This trend of oscillations appears to be merely the continuation of a pattern of variability extending back well into the Tertiary period and possibly beyond. During the last few million years, the duration and the amplitude of these climate cycles have increased. Large global interglacial-glacial-interglacial climate oscillations have been recurring at approximately a 100,000-year periodicity for the last 900,000 years, though each individual cycle has had its own idiosyncrasies in terms of the timing and magnitude of changes (Adams, Maslin, and Thomas, 1999). 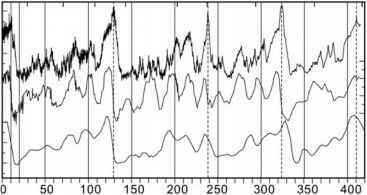 The Quaternary ice ages had a cyclic pattern. Ice sheets formed and then retreated roughly 25 times in the last 2.5 million years. Over the past 425,000 years, the Earth has experienced four lengthy glacial periods as shown in Figure 1.1. The last glacial period is known as the Wisconsin Glacial period. During the coldest segment of the last glacial period, all of Canada, portions of the northern United States, and large portions of northern Europe and Russia were covered with ice sheets that were up to 3,000 m to 4,000 m thick. Figure 1.1. Vostok ice core data. The upper curve is the variation in deuterium content vs. depth of the ice core that is interpreted as a function of temperature vs. time. 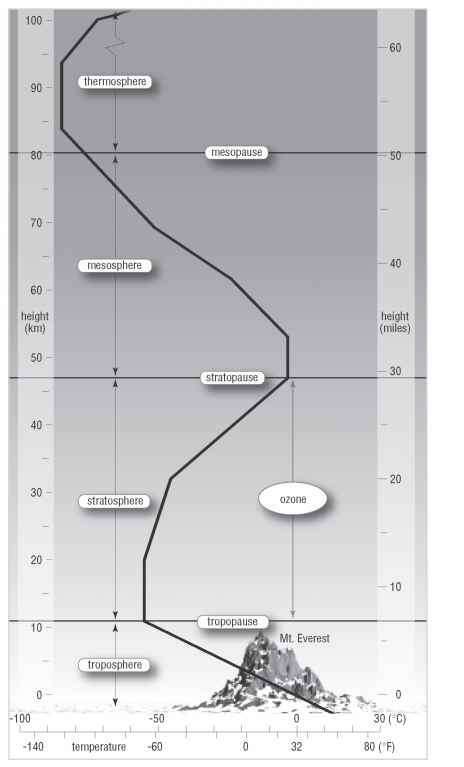 The middle curve is the 18O profile in the atmosphere from gas bubbles. The lower curve is ice volume implied by 18O in the ice core. Adapted from Petit et al. (1999). Figure 1.2. Four glacial periods of the Pleistocene showing slow buildup of ice followed by rapid warming and short interglacial periods. Adapted from de Blij (2005). 1.2. The highest temperatures reached during previous interglacial periods were slightly higher than we experience today. It seems evident that these alternating periods of ice ages and interglacials must be driven by positive feedback processes. Simplistically, if high-latitude ice spreads for some reason, that would increase reflection of incident solar irradiance, thus cooling the area, and causing spreading of the ice, etc. A number of such feedback mechanisms have been discussed, but none are well understood (Bony et al., 2006). Such feedback processes may proceed to an inordinate extent, once underway in earnest. A number of conceptual triggers for initiating these extreme feedback processes have been proposed but none is entirely satisfactory. Noting the quasi-periodic nature of ice age episodes, a number of investigators have sought explanations based on periodic variations in the Earth's orbit about the Sun. Milankovitch spent a lifetime studying this problem. Three factors enter: (1) eccentricity (elongation of ellipse) of the Earth's orbit (period ^100,000 years), (2) tilt of the Earth's axis to the plane of its motion (period ^41,000 years), and (3) occurrence of seasons relative to the position along elliptical orbit ("precession of the equinoxes'') (26,000 years). As these changes in the Earth's orbit occur independently, they create a history of changing solar inputs to the Earth. These changes are complex and involve variable inputs to different latitudes at different seasons. It is likely that the solar inputs to higher latitudes are most important in regard to ice ages, but it is not clear whether summer or winter is the dominant factor. A number of studies have attempted to carry out mathematical fitting of variations in solar intensity at higher latitudes resulting from variations of the above three orbital parameters to ice core data on historical global ice volume (e.g., Rial, 1999; Elkibbi and Rial, 2001). But, there are many aspects of the ice core record that remain difficult to explain. The general trends that are observed are slow buildup of ice taking many tens of thousands of years followed by relatively sudden reductions over comparatively short periods (centuries or even decades), followed by thousands to tens of thousands of years of interglacial warmth, and then the whole process begins again. Is this part of a regular pattern induced by astronomical variations and abetted by feedback mechanisms, or is it the result of random triggers for feedback? We don't know. Around 130,000-110,000 years ago (the "Eemian interglacial''), the Earth's climates are believed to have been generally much like those of today, though perhaps somewhat warmer and moister in many regions. The climate record derived from long ice cores taken through the Greenland ice cap suggests that the warm climate of the Eemian might have been punctuated by a number of sudden and fairly short-lived cold phases, but these results remain controversial. Though the time at which the Eemian interglacial ended is subject to some uncertainty (^110,000 years ago), it appears to have been a relatively sudden event (perhaps a few hundred years) and not a gradual slide into colder conditions taking many thousands of years. Following this initial cooling event, conditions often changed in sudden leaps and bounds followed by several thousand years of relatively stable climate or even a temporary reversal to warmth, but overall there was a decline in temperature. Northern forest zones retreated and fragmented as the summers and winters grew colder. Large ice sheets began to grow in the northern latitudes when the snow that fell in winter failed to melt in summer, and instead piled up from one year to the next until it reached thousands of meters in thickness. As the cold grew more severe, the Earth's climate also became drier because the global weather machine that evaporates water from the oceans and drops it on the land operates less effectively at colder temperatures and when the polar sea ice is extensive. Even in areas that were not directly affected by the ice sheets, aridity began to cause forests to die and give way to dry grassland, which requires less water to survive. Eventually, much of the grassland retreated to give way to deserts and semi-deserts, as global conditions reached a cold, dry low point around 70,000 years ago. By this time, ice sheets covered most of northern Europe and Canada. By around 60,000-55,000 years ago, conditions around the world had become warmer, though still generally colder than today. The ice melted back partially, and there followed a long middling phase in which the climate oscillated between warmer and colder conditions, often in sudden jumps. During some parts of this phase, conditions in the tropics may have been moister than they are at present, and at other times they were drier. Generally, the mid-latitude zones seem to have been drier than present, with cold steppe and wooded steppe instead of forests. 1. 150,000 ybp (years before present)—cold, dry full glacial world. 2. ^130,000 ybp—rapid warming initiates the Eemian interglacial. 3. 130,000-110,000 ybp—global climates generally warmer and moister than at present, but with progressive cooling to temperatures similar to present (except for possible global cold, dry event at 121,000 ybp). 4. 110,000? ybp—a strong cooling marks the end of the Eemian interglacial. 5. 105,000-95,000 ybp—climate warms slightly but still cooler and drier than present; strong fluctuations. 6. 95,000-93,000 ybp—another cooler phase similar to that at 110,000 ybp. 7. 93,000-75,000 ybp—a milder phase, resembling that at 105,000-95,000 ybp. 8. 75,000-60,000 ybp—full glacial world, cold and dry. 9. 60,000-25,000 ybp—"middling phase'' of highly unstable but generally cooler and drier-than-present conditions. 10. 25,000-15,000 ybp—full glacial world, cold and dry (includes the "Last Glacial Maximum''). This period includes two "coldest phases'' (Heinrich Events) at around 23,000-21,000 ybp and at 17,000-14,500 ybp. 11. 14,500 ybp—rapid warming and moistening of climates in some areas. Rapid deglaciation begins. 12. 13,500 ybp—nearly all areas with climates at least as warm and moist as today's. 13. 12,800 ybp (±200 years)—rapid onset of cool, dry Younger Dryas period in many areas. 14. 11,500 ybp (±200 years)—Younger Dryas ends suddenly, back to warmth and moist climates. 15. 9,000-8,200 ybp—climates warmer and often moister than today's. 16. ^8,200 ybp—sudden cool and dry phase in many areas. 17. 8,000-4,500 ybp—climates somewhat warmer and moister than today's. 18. Since 4,500 ybp—climates fairly similar to the present (except about 2,600 ybp— relatively wet/cold event (of unknown duration) in many areas). The point at which the global ice extent was at its greatest, about 21,000 ybp, is known as the Last Glacial Maximum (LGM). During the Last Glacial Maximum, the Earth was much more arid than it is at present, with desert and semi-desert occupying huge regions of the continents and forests were shrunk back. But the greatest global aridity (rather than ice extent) may have been reached slightly after the Last Glacial Maximum, somewhere during the interval 19,000-17,000 ybp. The extent and height of the North American ice sheets at the LGM in the most recent ice age was estimated by Dyke et al. (2002) to be as shown in Figure 1.3. Several models have been developed to estimate the evolution of the ice sheets during the last ice age (Charbit et al., 2007; Zweck and Huybrechts, 2003) but it is not clear to this writer that the models deal at all with why and how the ice sheets formed in the first place, or why and how they evolved the way that they did. Nevertheless they provide some interesting insights (see Figure 1.4, and Figure 1.5, color section). Global sea level and marine isotope curves place the maximum ice volume in the most recent ice age at 18,000 ybp. The most pronounced oceanic changes occurred in middle latitudes of the North Atlantic where August surface temperatures were > 10°C lower than modern values. Even so, the global ocean surface was claimed to be, on average, only 2.3°C cooler (Andrews and Barry, 1978). The development and expansion of the Laurentide Ice Sheet acted as a cold trap to prevent water vapor from reaching the highest polar latitudes. While this ice sheet peaked around 23,000 ybp, the Cordillera Ice Sheet began to develop around 20,000 ybp and reached its maximum around 14,000 ybp. It appears that the water vapor emanating from the Laurentide Ice Sheet as it warmed after 20,000 ybp may have provided the moisture needed to build the Cordillera Ice Sheet between 20,000 and 14,000 ybp (Dyke et al., 2002). Figure 1.3. Extent and height of the North American ice sheets at the maximum in the most recent ice age. Height is measured in meters. Adapted from Dyke et al. (2002) by permission of Elsevier. Figure 1.4. 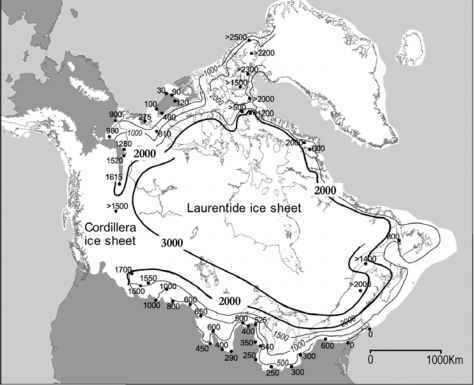 Build-up and decline of the Laurentide Ice Sheet. Area is in units of 1012m2. Volume is in 1015 m3. Adapted from Charbit et al. (2007). 0ver millions of years, there have been many ice ages that have left their record in ice cores and other proxies. There is a periodicity to these ice ages, but that periodicity is not uniform or amenable to simple interpretation. The repeatable pattern is for slow buildup of ice sheets over many tens of thousands of years, followed by a rather abrupt deglaciation that may require just a few thousand years with significant warming over hundreds of years. 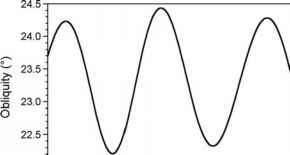 This sawtooth pattern seems to be fairly repeatable, although there are typically many fluctuations during the cooling cycle, and often, violent fluctuations during the rapid deglaciation. It is natural that scientists have sought a relationship between the periodicities of the ice ages and the periodic variations in the Earth's orbit around the Sun, assuming that the ice ages (and their terminations) are somehow tied to variability of solar irradiance, particularly at high latitudes. Although solar irradiance variations could not possibly account for the violent fluctuations that have occurred, it has been conjectured that solar irradiance variations may act as triggers to initiate trends that are further propagated by feedback mechanisms. Numerous articles and books support this view (e.g., Anon. (G); Berger and Loutre, 2002; Imbrie and Imbrie, 1979; Macdougall, 2004). However, the connection between variations in solar irra-diance and ice ages may lie more in the eye of the beholder than in the actual data. The three parameters of the Earth's orbit that are relevant here are (i) the eccentricity with a period of roughly 100,000 years but highly variable amplitude, (ii) the obliquity (angle that the Earth's spin axis makes with the plane of its motion) that varies between 22° and 24.5° with a ^41,000 yr period, and (iii) the longitude of perihelion (position along the Earth's orbit where closest approach to the Sun occurs) with a ^26,000 yr period. As the theory goes, when these three parameters happen to produce a minimum in solar irradiance at higher latitudes, the ice age is set in motion. However, the small variations in the Earth's orbit do not appear to be large enough to produce the massive gyration in the Earth's climate in the past 400,000 years for which we have ample evidence. In particular, the glaciation that occurred in the most recent ice age (as illustrated in Figures 1.1-1.4, and in the color section Figure 1.5) do not seem to be associated with any solar "triggers". Figures 1.6-1.8 show the orbital parameters over the past 100,000 years, and Figure 1.9 shows the annual integrated summer solar irradiance on a horizontal surface (assuming 100% atmospheric transmission) for various latitudes. It is difficult to associate these changes in orbital parameters and solar irradiance with the massive changes in climate that took place during that period. Similar plots over the 400,000 yr span of the past four ice ages, lead to the same conclusion; solar irradiance variations are too small and much too gradual to produce or terminate the most recent ice ages. The rapidity of historical changes suggests that large heat flows are involved, which then suggests that ocean currents play a significant role. Figure 1.6. 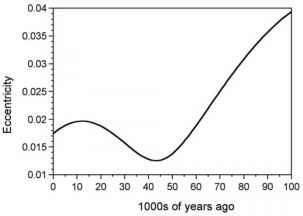 Variation of the eccentricity of the Earth's orbit during the past 100,000 years. over various time periods. Rial (1999) and Elkibbi and Rial (2001) are examples of such studies. Over the last million years, the Earth has experienced at least ten major glaciations, which according to the astronomical theory of the ice ages are the consequence of secular variations in irradiance caused by changes in Earth's orbital eccentricity, axial tilt, and longitude of perihelion (see Figure 1.10). However, a satisfactory explanation of how the changes in orbital eccentricity are transformed into the observed quasi-periodic fluctuations in global ice volume indicated by data has not yet been found (Rial, 1999). Roe (2006) argued that we are not yet ready to explain how gigantic ice sheets form and dissipate. Instead, all one can seek is a correspondence in time of orbital-induced variations in solar irradiance with proxy evidence of ice sheet extent. How glacial and interglacial relate to the ice age?